At 31, he wrote the widely circulated “Summary View of the Rights of British America “ and retired from his law practice. At 33, he took three years to revise Virginia ‘s legal code and wrote a Public Education bill and a statute for Religious Freedom . At 55,he drafted the Kentucky Resolutions and became the active head of Republican Party. 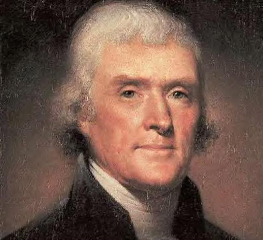 At 83, he died, on the 50th anniversary of the Signing of the Declaration of Independence along with John Adams . "It is incumbent on every generation to pay its own debts as it goes, a principle which if acted on, would save one-half the wars of the world." "No free man shall ever be deprived the use of arms." "I believe that banking institutions are more dangerous to our liberties than standing armies. If the American people ever allow private banks to control the issue of their currency, first by inflation, then by deflation, the banks and corporations that will grow up around the banks will deprive the people of all property — until their children wake-up homeless on the continent their fathers conquered." I wish we could get this out to everyone!